Did you know that according to the IUCN primates are distributed amoung 90 different countries in Africa, Asia and the Neotropics? If we consider that there are almost 200 states on earth, then we can say that almost every second state hosts primates (not including humans of course). However, did you also know that 65%, that means 286 of 439 primate species occur in only four countries? That is an impressing statistic for the four countries. You probably have already imagined that Brazil is one of those four countries. 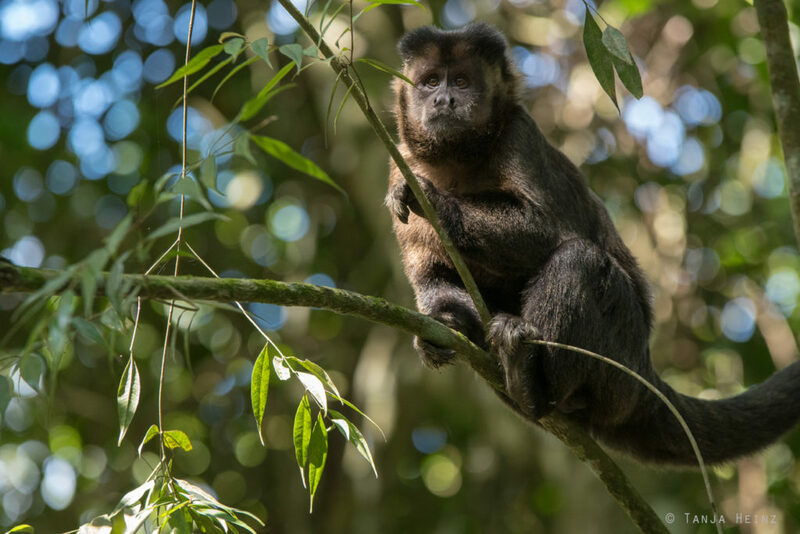 Of course, Brazil is at the top worldwide with 102 primate species. That means with 23% of all primates worldwide. 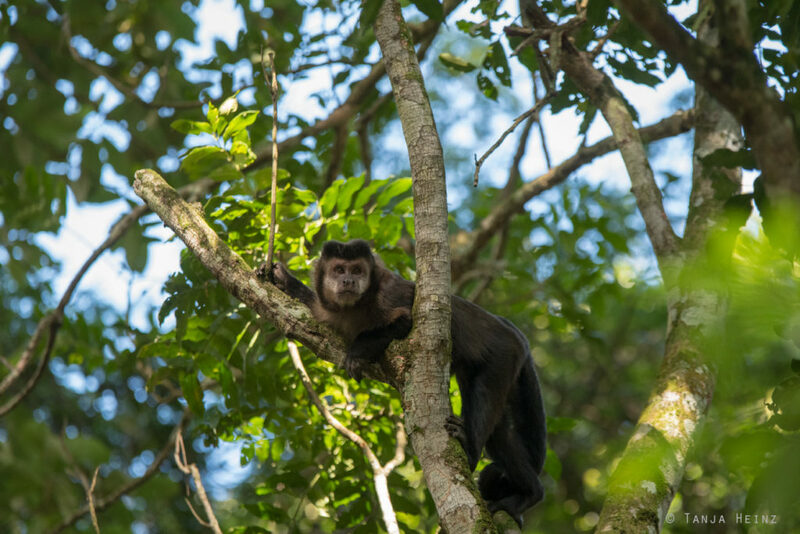 At the second position after Brazil is Madagscar with 100 primate species (22.8%). But also Indonesia with 48 primate species (11%) and the Democratic Republic of Congo with 36 primate species (8%) host a great number of primates. Unfortunately, there is also a less positive statistic. About 60% of primate species in those countries are either “vulnerable”, “endangered” or “critically endangered” according to the IUCN. 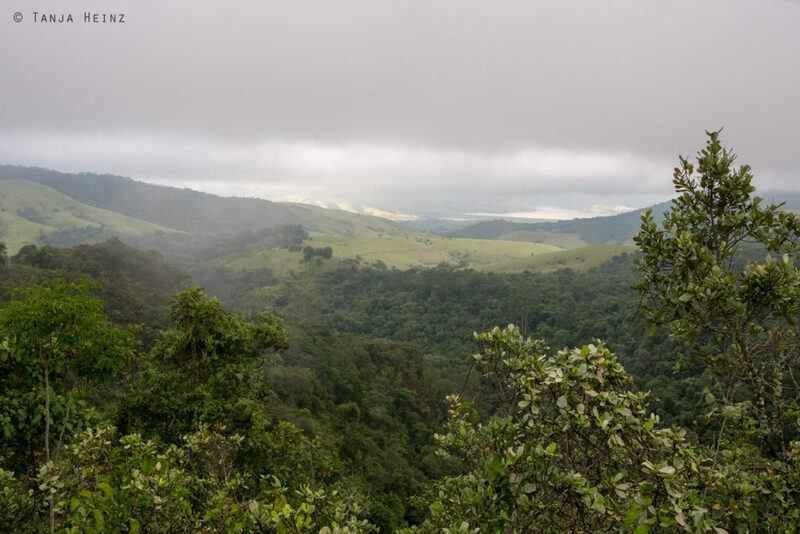 In Brazil habitat loss and habitat fragmentation is one of the biggest threats for primate species. 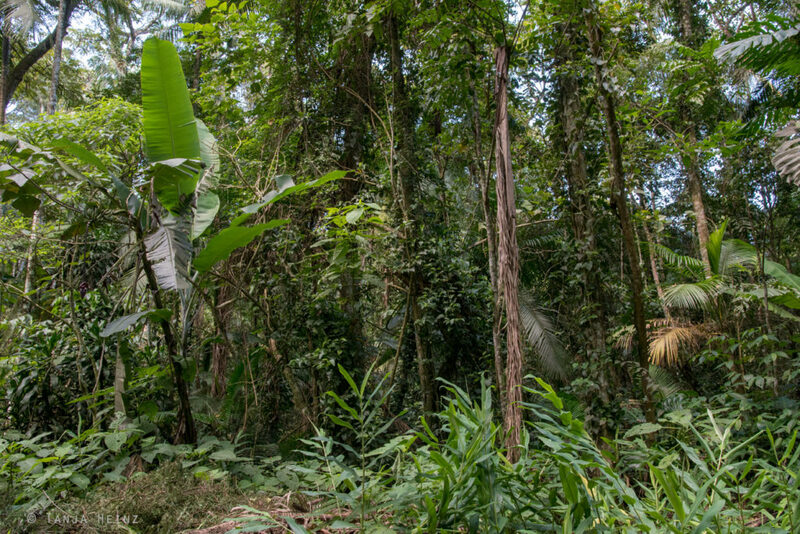 Although deforestation in Brazil decreased from 2005 to 2012 by 80%, in 2016 it rose dramatically again. 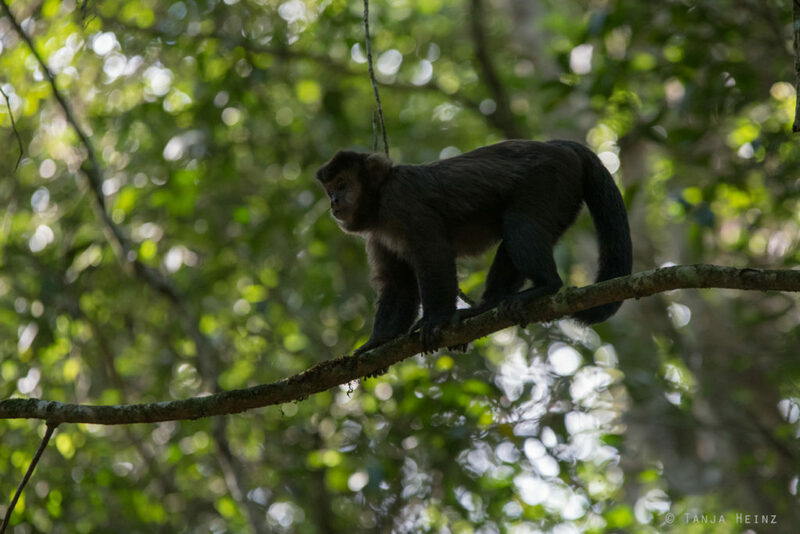 Due to the worldwide population growth, and consequently, the expansion of agricultural areas, the pressure on primate species will further increase. Especially in Brazil the number of agricultural areas increases. Here, too, Brazil is at the top when compared to the other three countries. 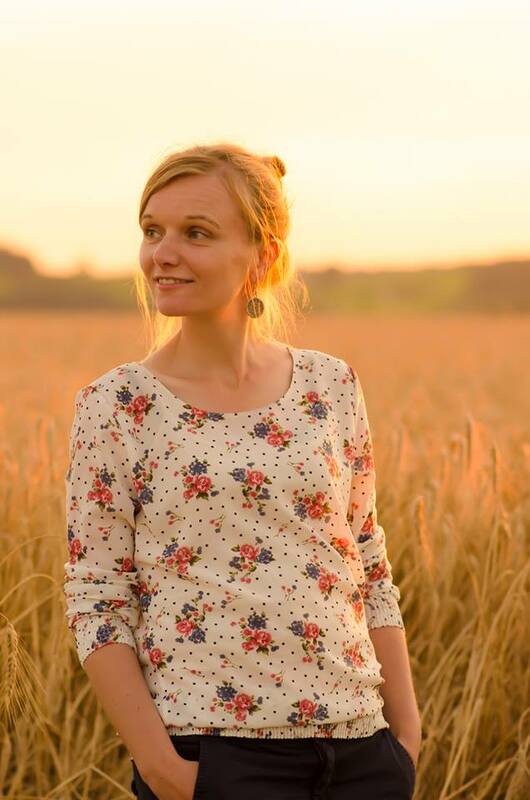 This is not only because of the internal population growth, but also due to global markets and the increasing demand of food (and thus agricultural areas). This is not a problem only for Brazil, but worldwide. One problem that is restricted predominantly to Brazil at the moment is the outbreak of yellow fever since 2016 in the Southeast of the country. The yellow fever virus has killed already thoursands of primates. Therefore, a yellow fever vaccination is very important when entereing the habitat of primates in order to prevent the further distribution of the virus. Unfortunately, not all people know that. Therefore, a campaign in Brazil was started that informs about the yellow fever virus. We saw one poster at the entrance of the Itatiaia National Park. The Hashtag #aculpanãoédomacaco translated means that the yellow fever is not the fault of the monkeys. 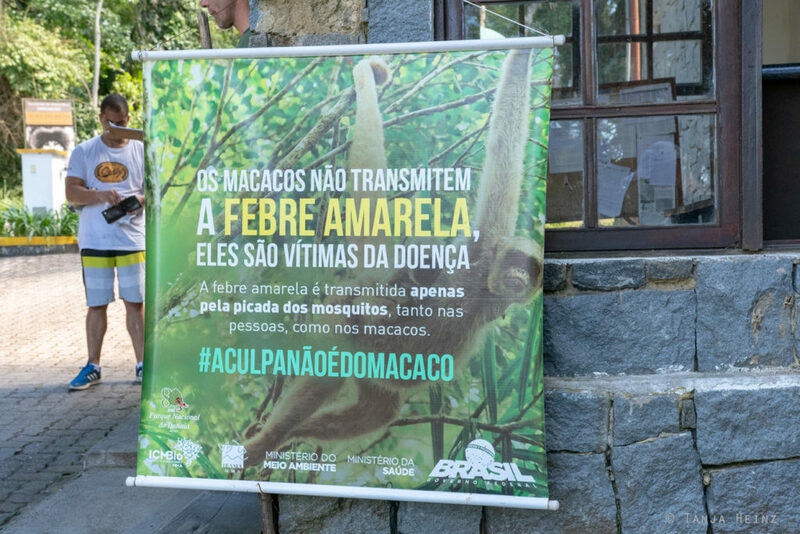 The poster in the entrance area of the Itatiaia National Park informs about the fact that the yellow fever virus is not transmitted by the monkeys but through mosquitos from primate to primate (including humans). Of course we entered Brazil only with a yellow fever vaccination! And this was not only for our own protection, but also for the protection of other primates we encountered. 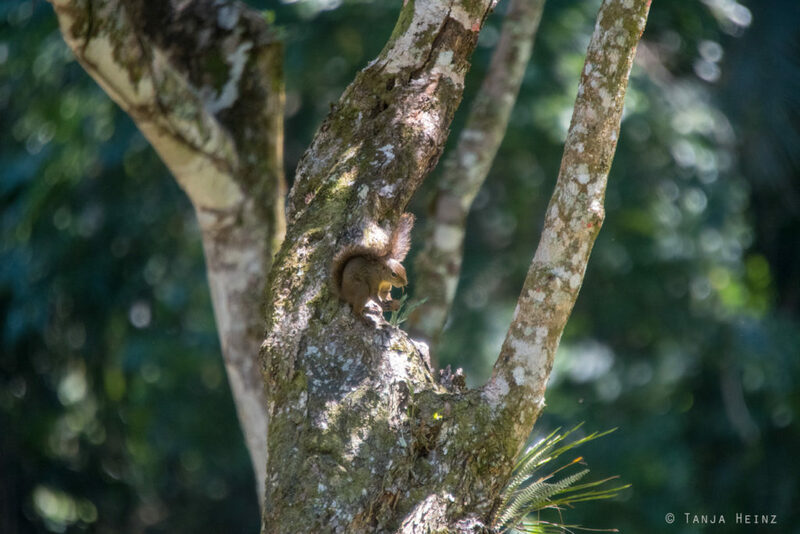 The Itatiaia National Park is home not only for many birds, like I told in my previous article, but also for several primates and many other mammals. On our first day in the Itatiaia National Park we participated in a bird excursion with Hudson from BirdRio Birdwatching. On our second day we explored the Itatiaia National Park on our own. At first a dense cloud layer covered the sky on our second day. 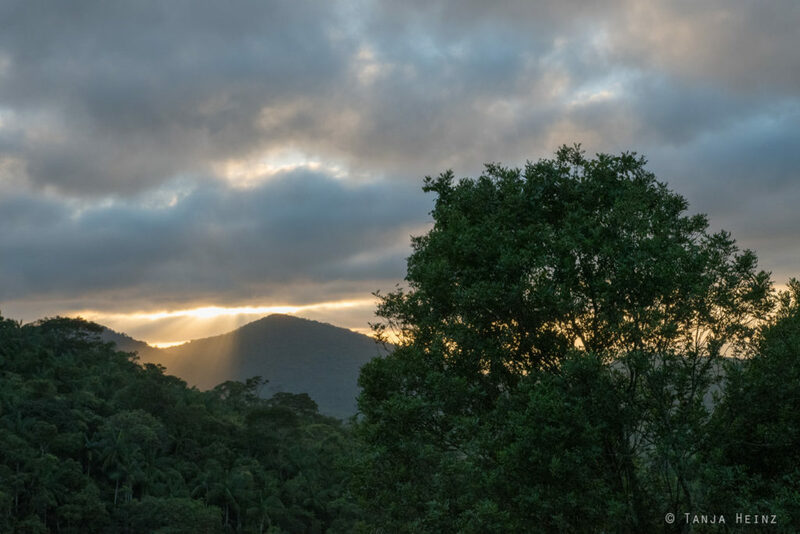 Although the day did not seem so inviting at the beginning, we started our day in order to explore the wildlife of the Itatiaia National Park. If you are looking for wild animals – wheather birds or mammals – you always need luck and especially patience. 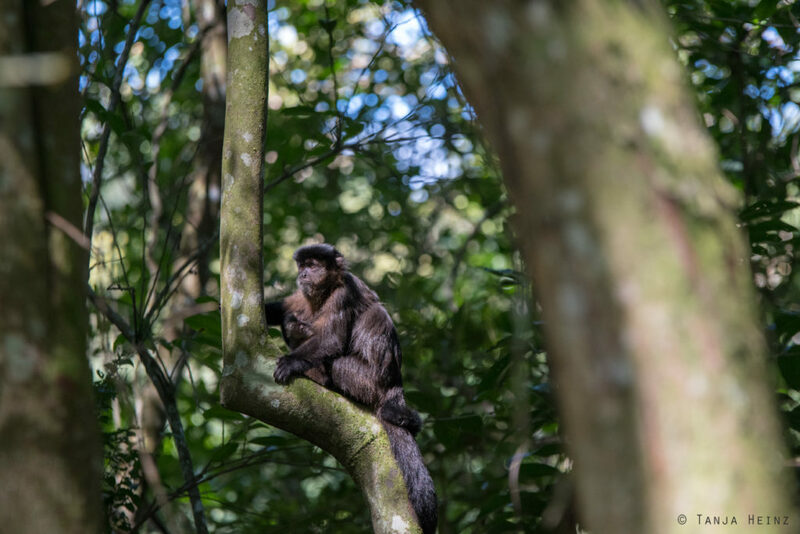 While I learned a lot about birds on my first day at the bird excursion, on our second day we were looking specifically for monkeys in the Atlantic Forest. 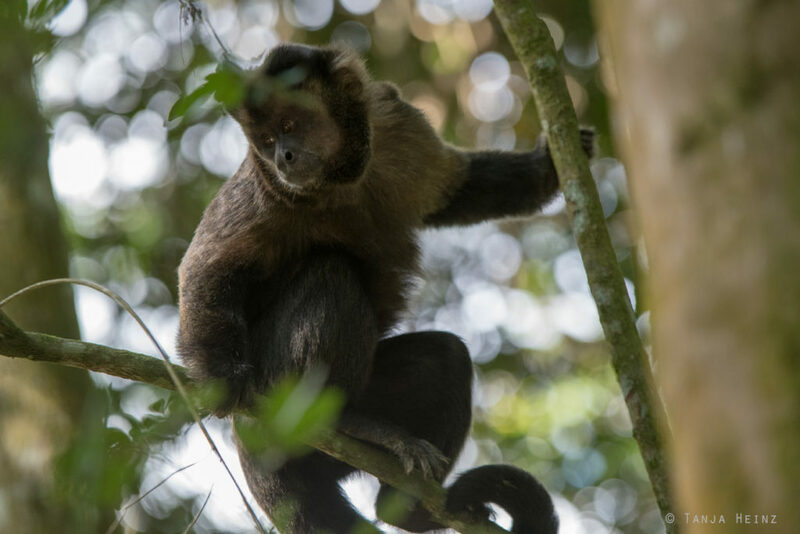 We knew that there are monkeys in the Itatiaia National Park, because we went to the vistor center of the national park were we got detailed information about the fauna in Itatiaia Naional Park. 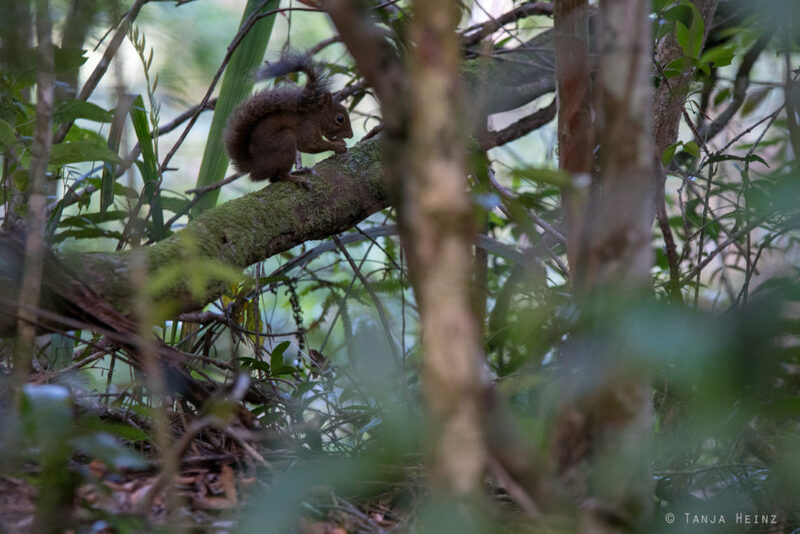 Including much information about mammals in the Itatiaia National Park. I was especially impressed by the photography exhibition by the artist Christian Spencer and by the engineer Marcelo Souza Motta at the visitor’s center. They photographed with hidden cameras animals in their natural environment. 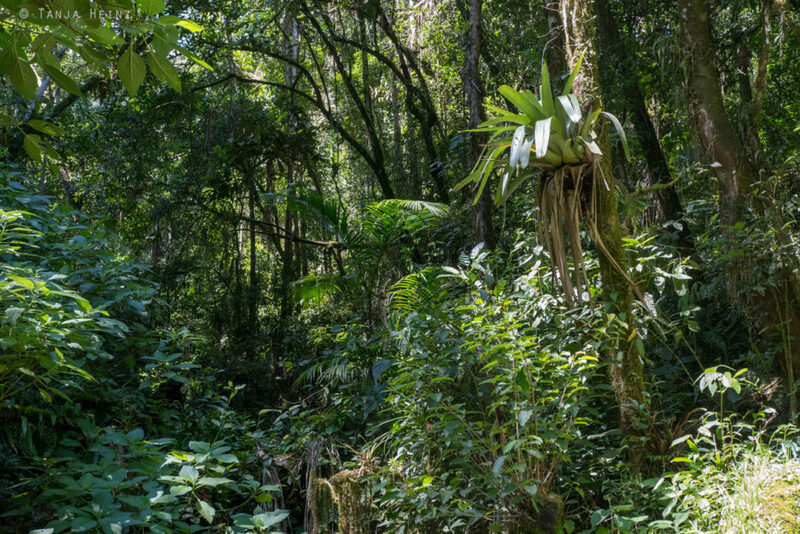 They used hidden cameras, because in the Atlantic Forest – including the Itatiaia National Park – live animals that are very elusive and are very rarely seen. At the end, they got photos from cougars (Puma concolor), margays (Leopardus wiedii), ocelots (Leopardus pardalis), jaguarundis (Puma yagouaroundi) and the Southern tigrina (Leopardus guttulus) which was recognized as a species in 2013. However, the two of them could also take photos from tayras (Eira barbara), Southern tamanduas (Tamandua tetradactyla), nine-banded armadillos (Dasypus novemcinctus), South American coatis (Nasua nasua) and white-lipped peccaries (Tayassu pecari) with their hidden cameras. 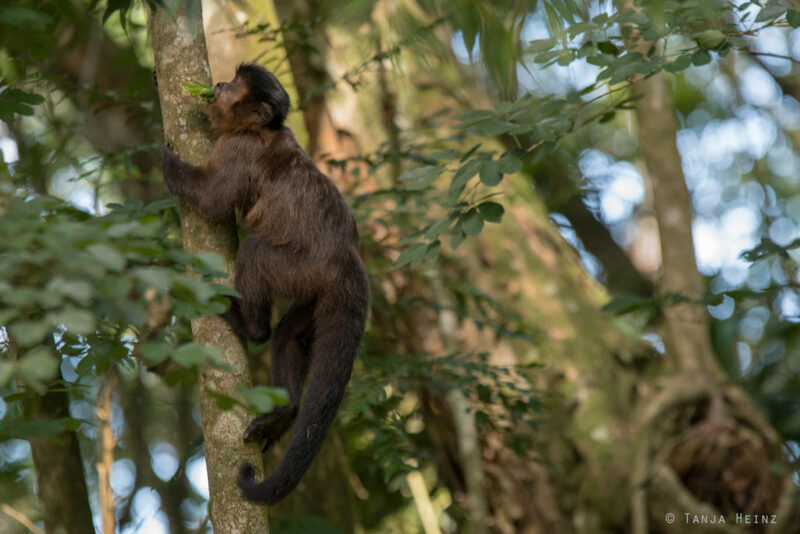 They got special photographs of monkeys like those of the Northern muriquis (Brachyteles hypoxanthus) and the black-fronted titis (Callicebus nigrifrons). The aim of the exhibition is to raise awareness about these elusive and mysterious animals and get a small glimpse into their lives. After this exhibition I was more curious and excited about all my upcoming observations. 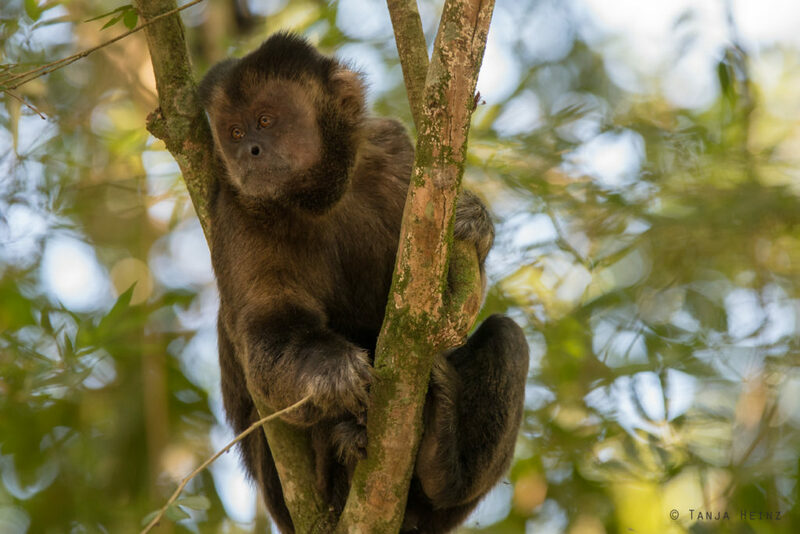 Although I knew after the exhibition in the visitor center that Northern muriquis live anywhere in the forests of the Itatiaia National Park, I did not expect to meet any of them in my search for primates like I did in the Feliciano Miguel Abdala Natural Reserve. 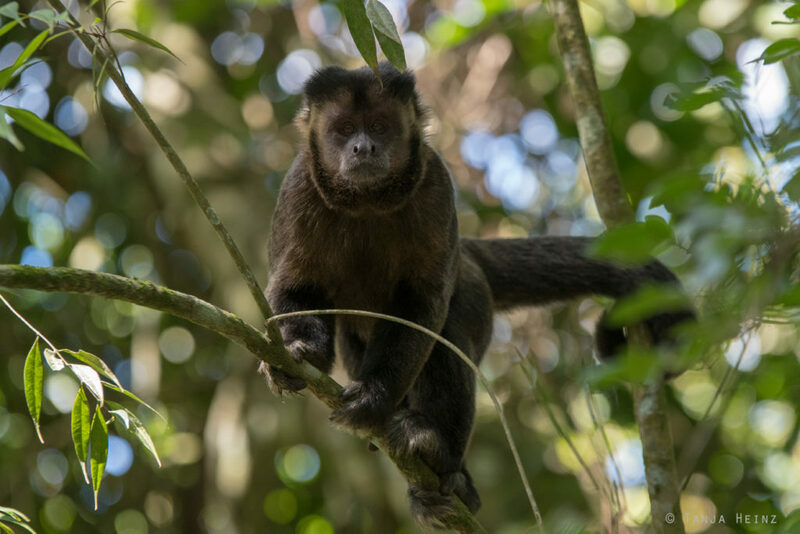 But as I heard that some capuchin monkeys live in the Itatiaia National Park as well, I was looking specifically for them on our second day. But actually we did not really know where we should start with our search. We knew that they stayed around the house of our accomodation on our first day. But where are they during the day? We did not know, but anyway we started our second day searching for them. But we were searching for them in vain until the afternoon. We only saw several squirrels (Gattung Sciurus). But suddenly we heard the roaring of some howler monkeys! What a surprise! 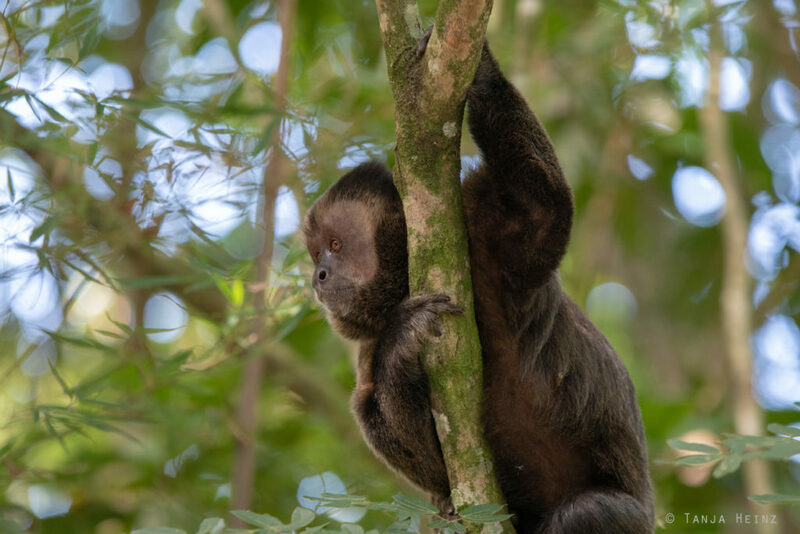 I never would have expected to meet some howler monkeys in the Itatiaia National Park. I was so lucky, I thought. However, at the end I was not so lucky as I thought initially. 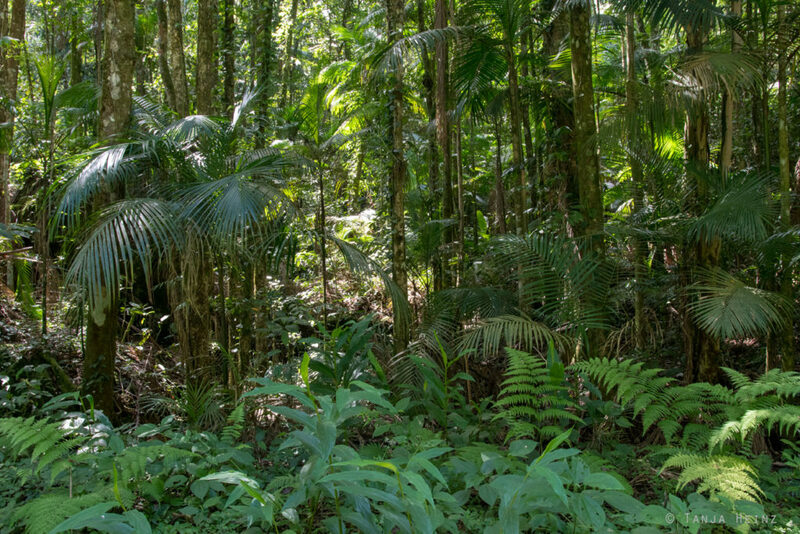 The dense vegetation did not allow us to walk into the direction of the howler monkeys. We tried to find a path into the direction of the roaring. Finally we gave up when we reached a small river. 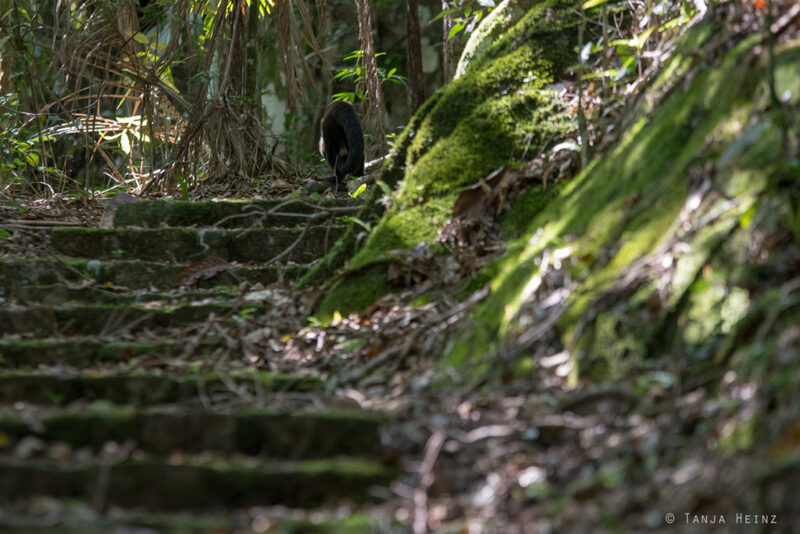 I directed my attention towards the forest where I heard the roaring of the howler monkeys. There was not path to the howler monkeys. That would have been to good to be true. But we stayed for some time at the river and then headed off again. During our walk I was continuously looking for something moving in the trees. 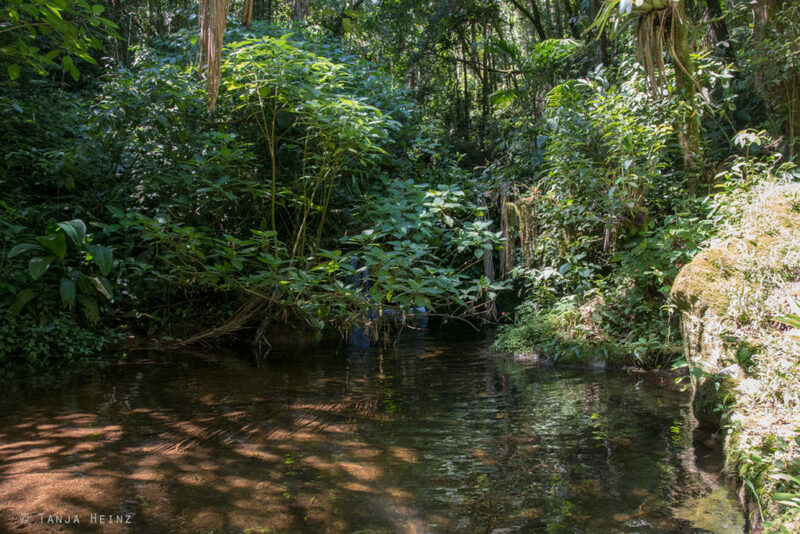 Sometimes the Atlantic Forest was less dense along our way. In the late afternoon we finally reached our goal for that day. 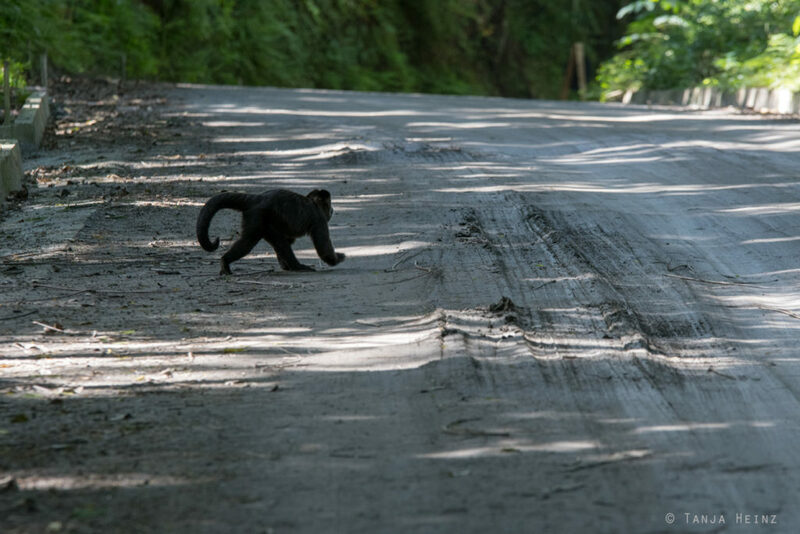 A capuchin monkey was crossing comfortably the road and looking up into the trees. 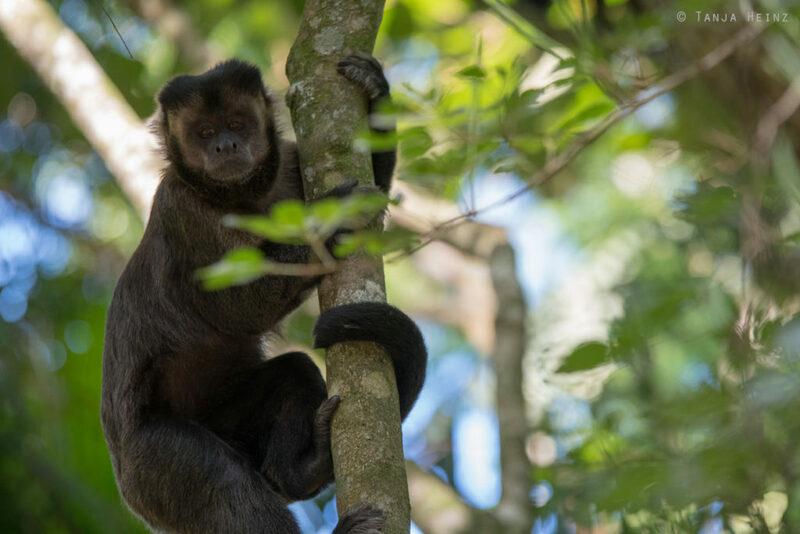 This capuchin monkey was a black capuchin (Sapajus nigritus). 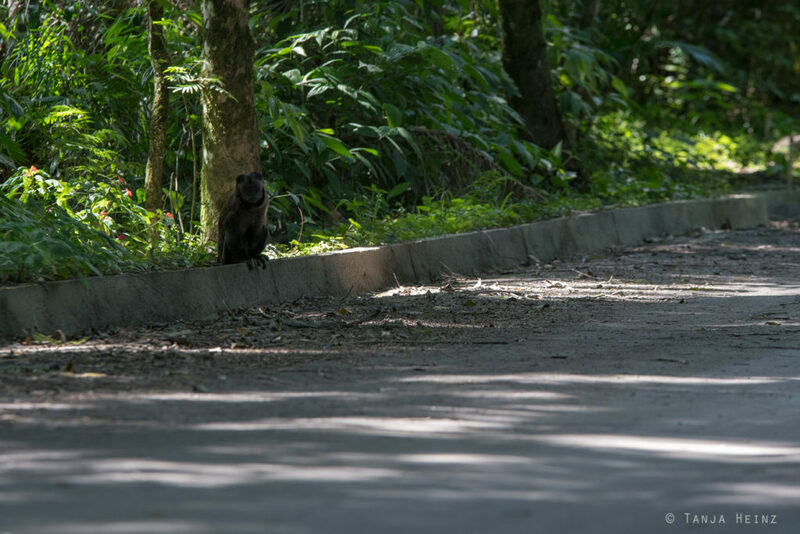 This black capuchin seemed to me very relaxed when it was sitting at the side of the road. 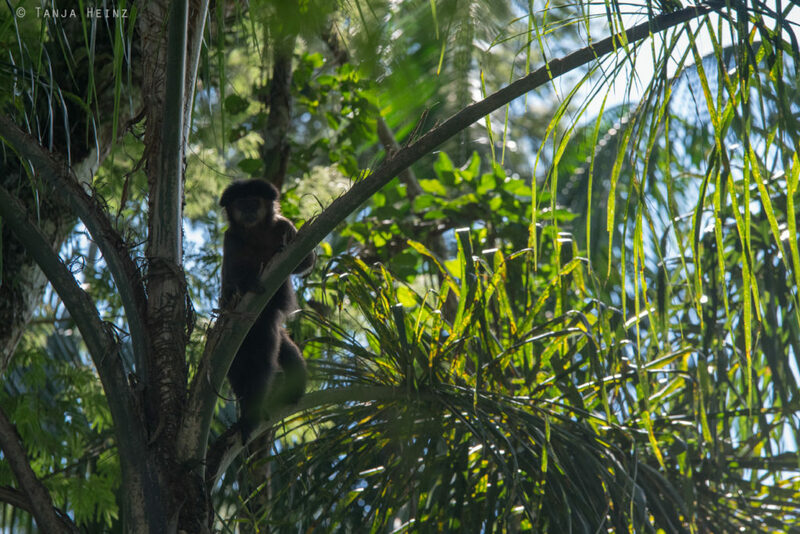 The black capuchin was looking into our direction. 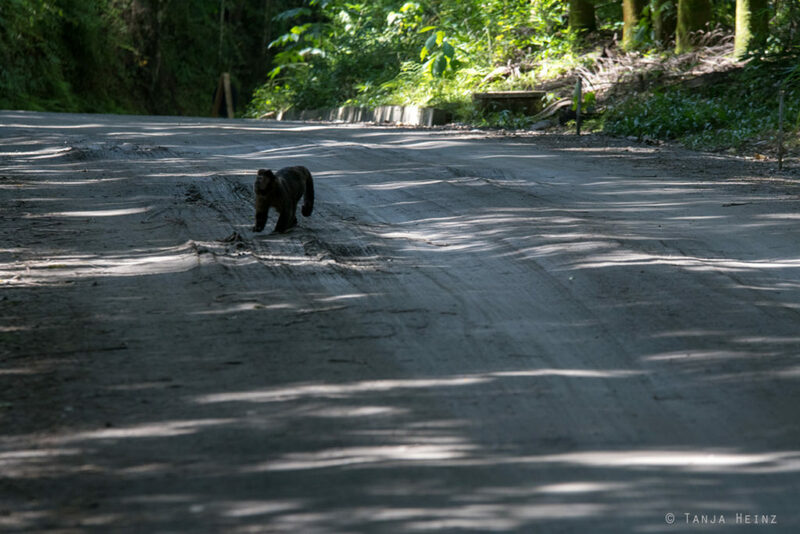 Only a few moments later the same individual stood up and crossed again the road. In the middle of the road the black capuchin paused for some moments and looked up the tree again. I thought, I’m sure that this animal is not alone. Indeed. 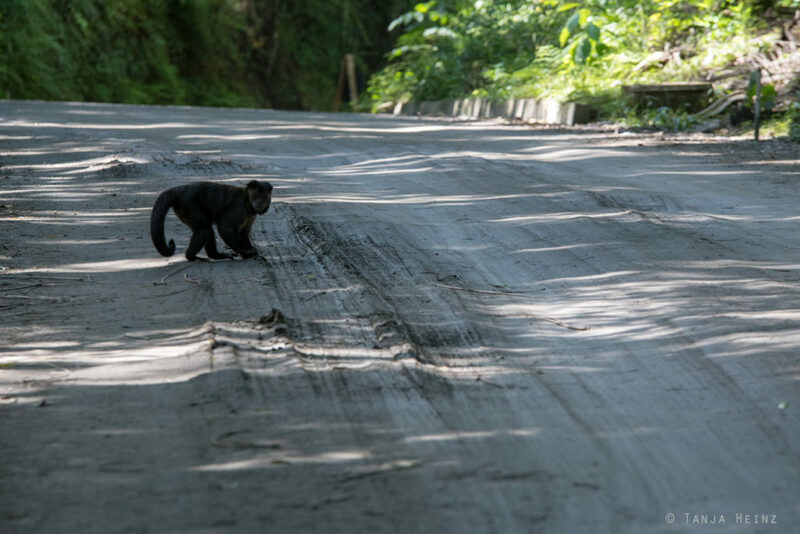 This black capuchin on the street was not alone. 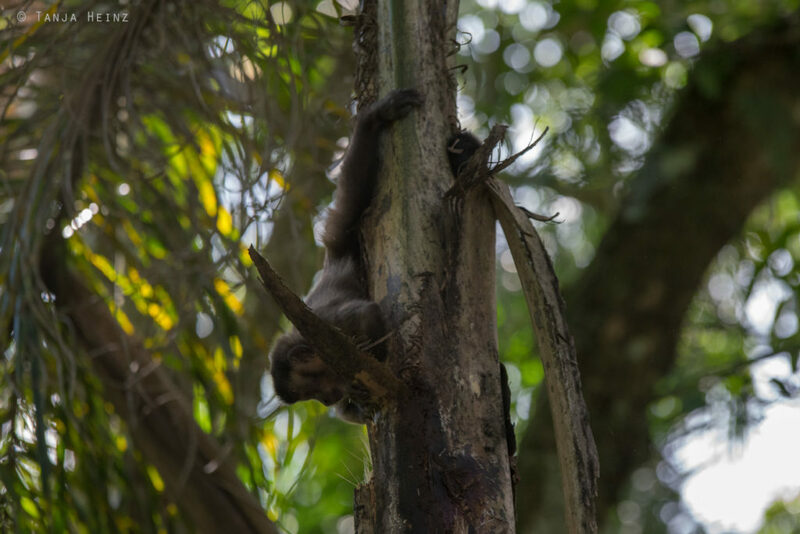 When I turned my head into the opposite direction I spotted another black capuchin clinging to a palm leave. Almost at the same time I spotted another black capuchin observing me. But when I was looking at it, the black capuchin was fleeing. I asked myself: How many are there around? As the group was apparently moving, I thought, probably I do not see all of them. 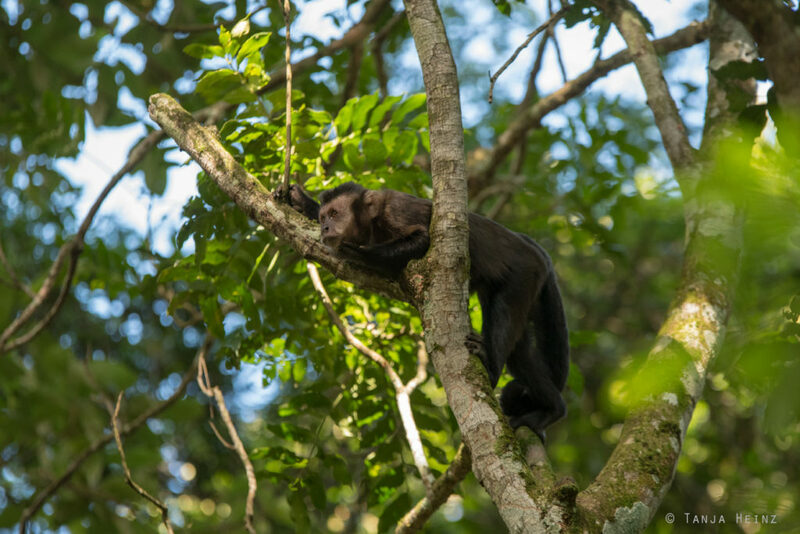 Black capuchins are like all primates very social animals and live in groups. One group consists in general of 6 to 20 animals with a hierarchy within the group and an alpha male at the top. By the way, since 2012 black capuchins belong to the Genus Spajus. That means to the robust capuchin monkeys. Before 2012 they belonged to the Genus Cebus or gracile capuchin monkeys, respectively. However, because of morphological and genetic differences Spajus and Cebus are now considered as two seperate genera. 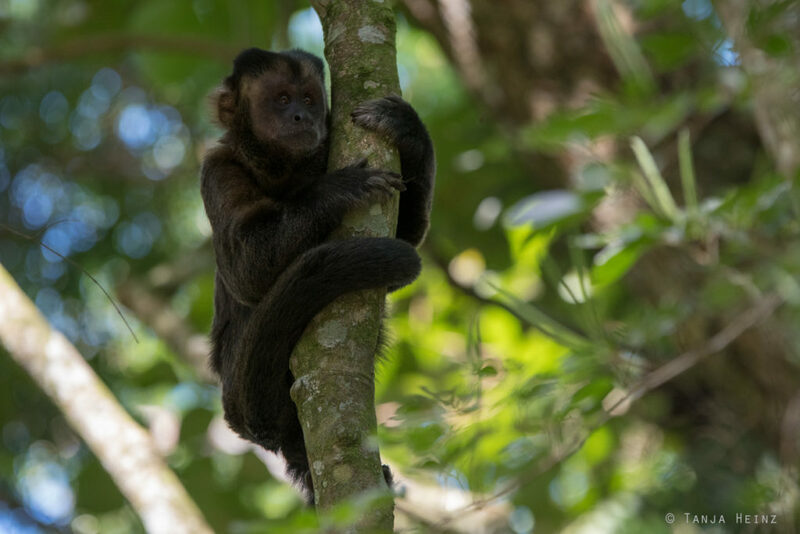 Nevertheless, sometimes black capuchins are still found under their original latin name Cebus nigritus instead of their new name Sapajus nigritus. 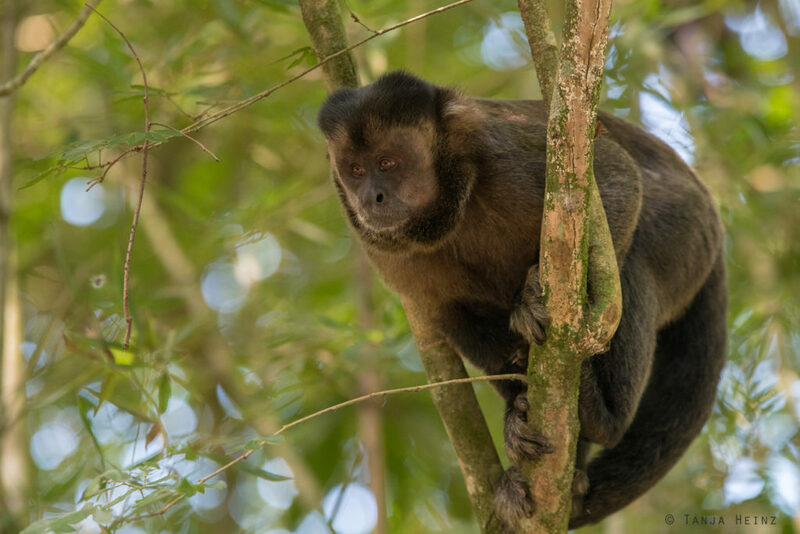 By the way, I met black capuchins already in Brazil in the Feliciano Miguel Abdala Natural Reserve and other robust capuchin monkeys – that is the crested capuchins – in the Reserva Natural Vale. One decisive characteristic among robust capuchin monkeys are their more or less pronounced crest. There are also individual differences. Some of them have quite pronounced crests. While I was observing the monkeys in the trees, several cars stopped. Most people stopped, took some photos and left again. 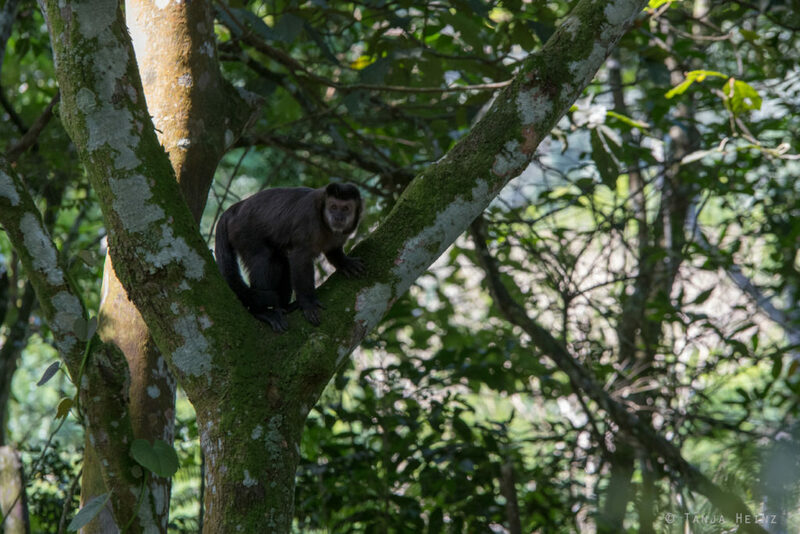 I was standing at the side of the road, but could not decide in some moments where to go next as more and more black capuchins arrived. They scattered on both sides of the road. 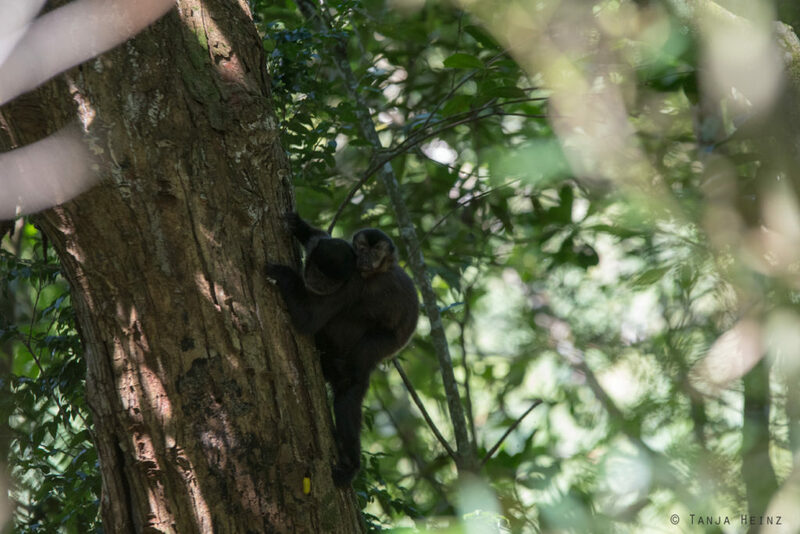 There was also a black capuchin with a young. When I observed them, I asked myself, are all members of the group involved in rearing the offspring like it is the case in golden lion tamarins and common marmosets? Is this the case in black capuchins as well? Thus far I could not find an answer for this question. And finally, the black capuchin with the young vanished again. I tried to be as invisible as possible while at the edge of the road in order to observe the animals. One of them apparently was looking for somehting under the tree bark. Another one made itself comfortable on a branch. However, in general the group appeared to be more on the move. Consequently, this monkey neither remained on its place on the branch. This black capuchin sat down again and looked around. But again this black capuchin could not remain quietly on its new place. What was on its mind? 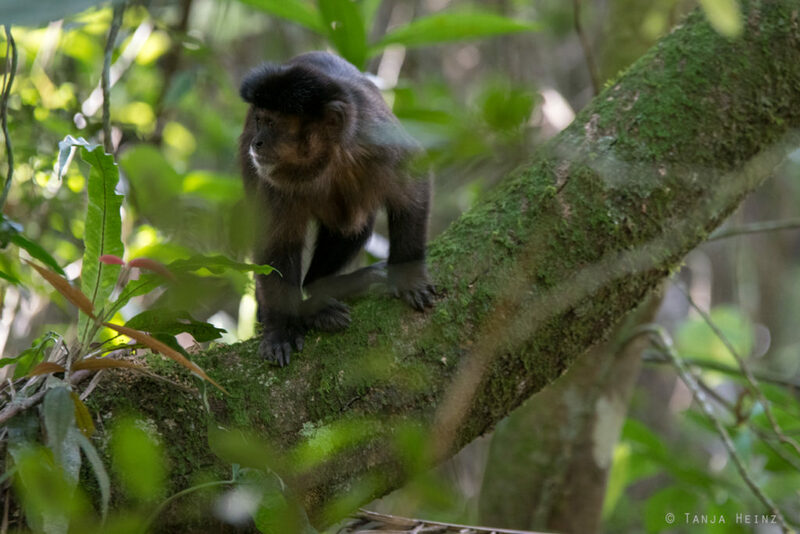 The black capuchin was looking around and around. As it was not looking into my direction, I assumed, that it didn’t care about me. 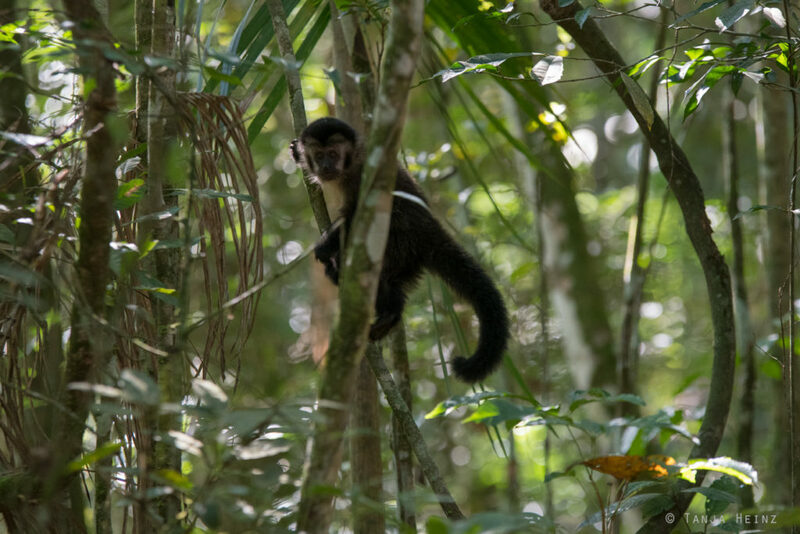 As there were many more black capuchins, I was looking around as well to find some more special behaviors of these monkeys. There was a small black capuchin close by the other animal. Curiously it was looking at me. 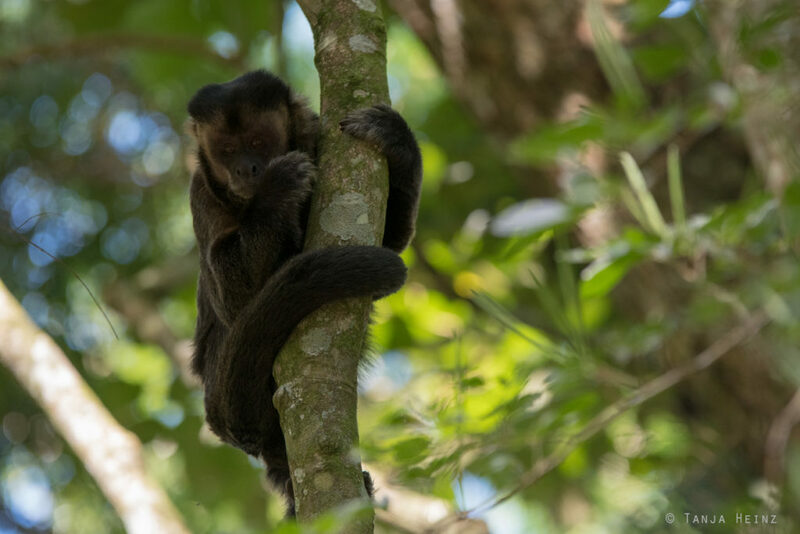 But the small black capuchin left and climbed up the tree. It made itself comfortable on a small branch and looked into my direction. Another black capuchin had some leaves in its mouth and climbed up a tree as well. 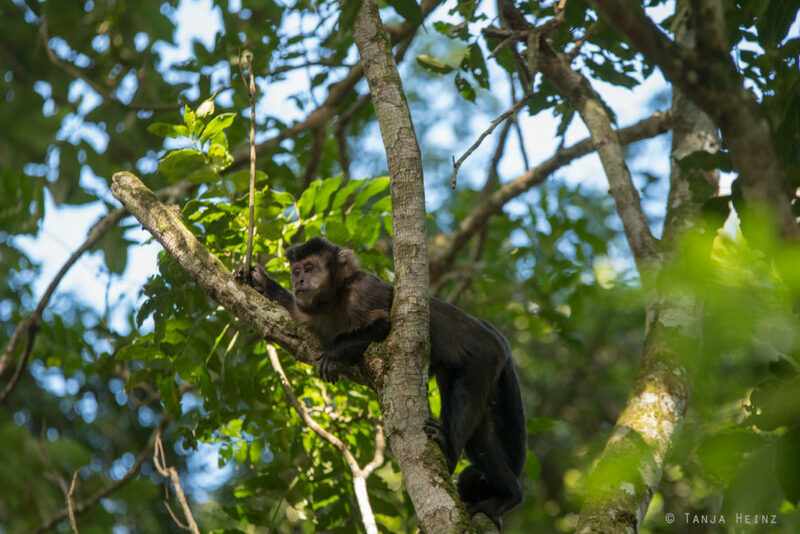 What do black capuchins eat I asked myself in this moment? Capuchins in general are omnivorous. They feed on insects, bird eggs, small invertebrates, but also leaves, seeds and fruits. Capuchins like black capuchins are very adaptable to different environments. However, they are not always popular among agriculturalist or forest managers, because they damage the bark of trees. 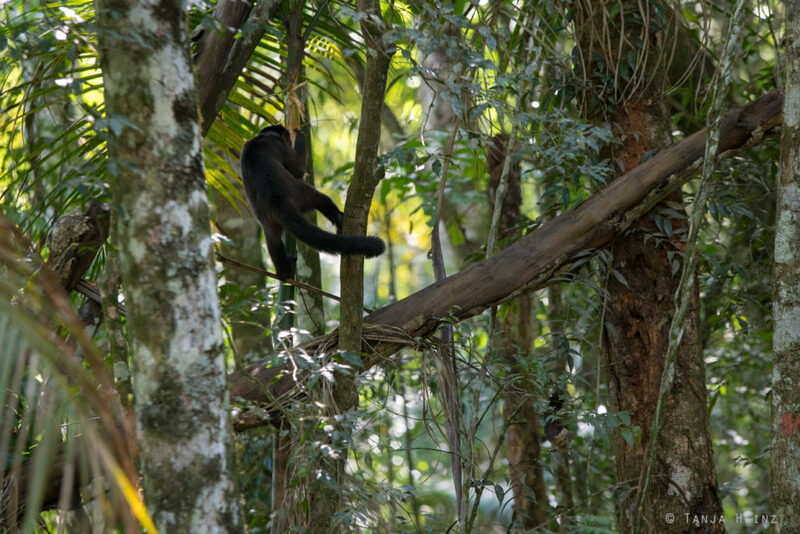 Even in the Itatiaia National Park I could observe this behavior in black capuchins. Why do they strip the bark? Apparently they strip barks when there are in general fewer fruits and seeds in the forest. 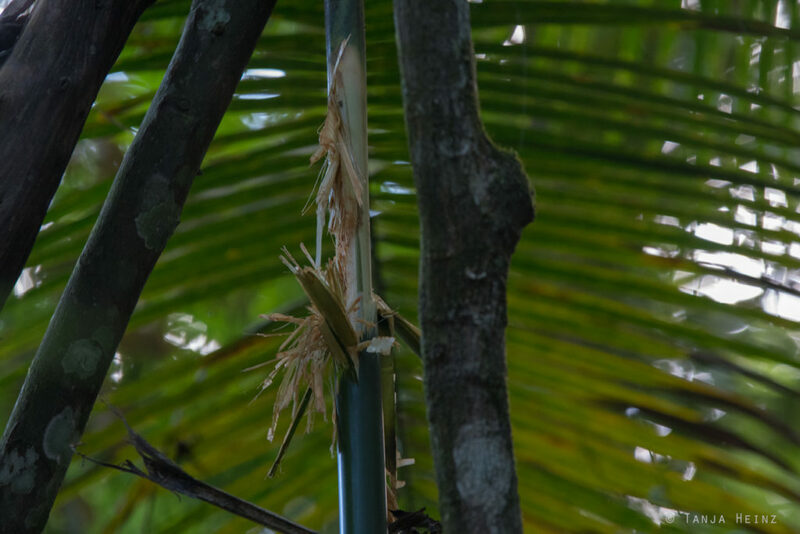 Because of this behavior the black capuchins often leave trees which look like this. In some forests they damage the basic food resource of other primates like in the forests where the golden lion tamarins live. 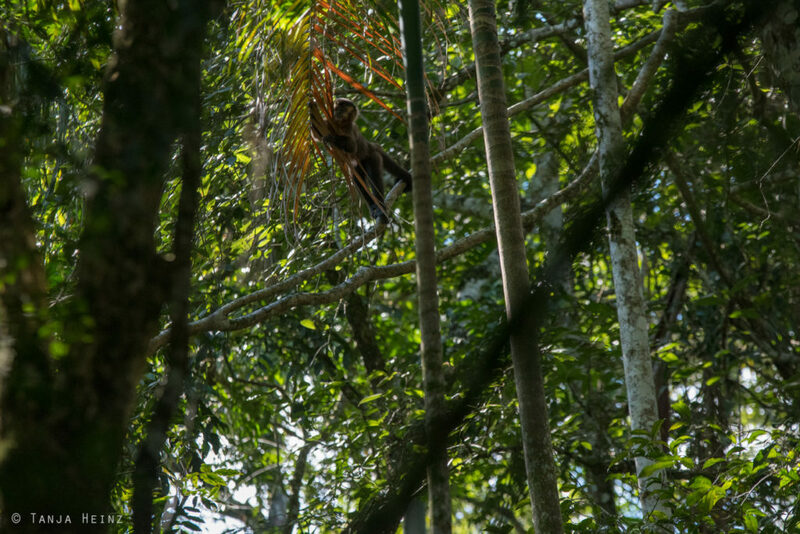 Are there guards within black capuchins as it is the case in groups of golden lion tamarins? One of the black capuchins anyhow looked a little bit like a guard. But honesly, it looked rather a little bit sleepy. Of course, I cannot really tell! 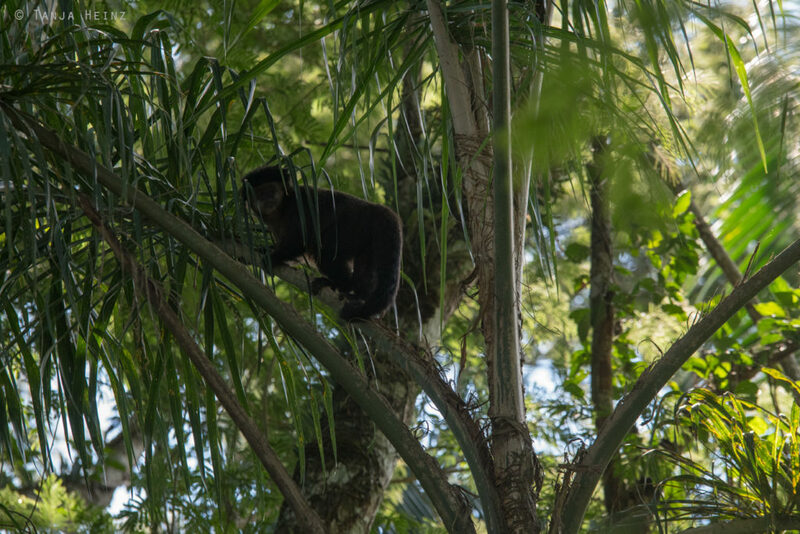 Later I could observe one of the black capuchins a little bit closer. This monkey neither relaxed on its branch. 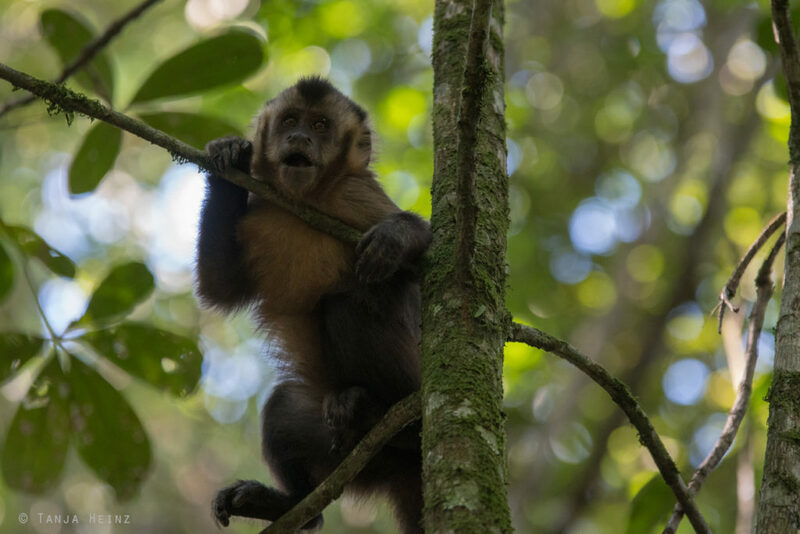 Why was this black capuchin so alert? 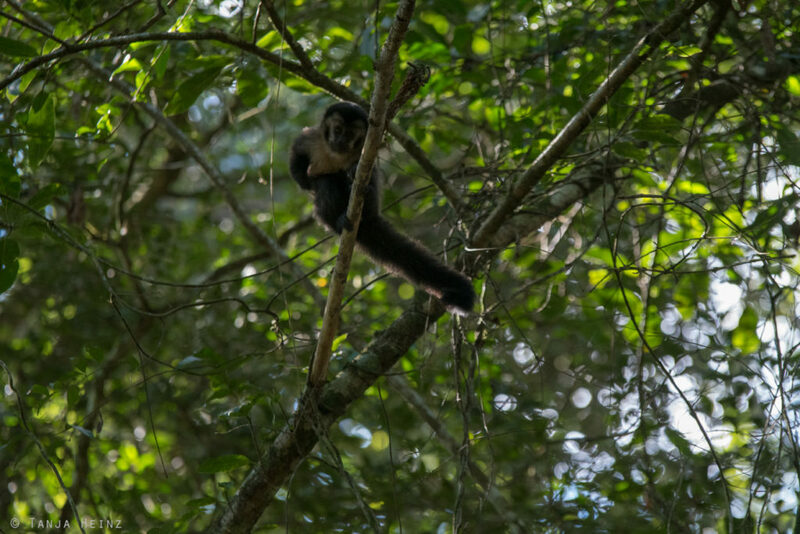 As I mentioned above, the black capuchins were rather on the move on this late afternoon in the Itatiaia National Park. It was not the hottest phase of the day. 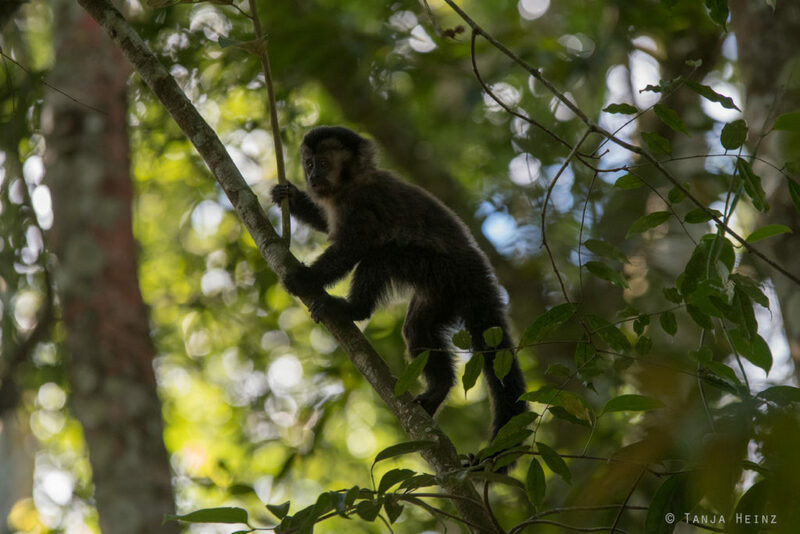 Finally, more and more monkeys vanished again in the dense Atlantic Forest. 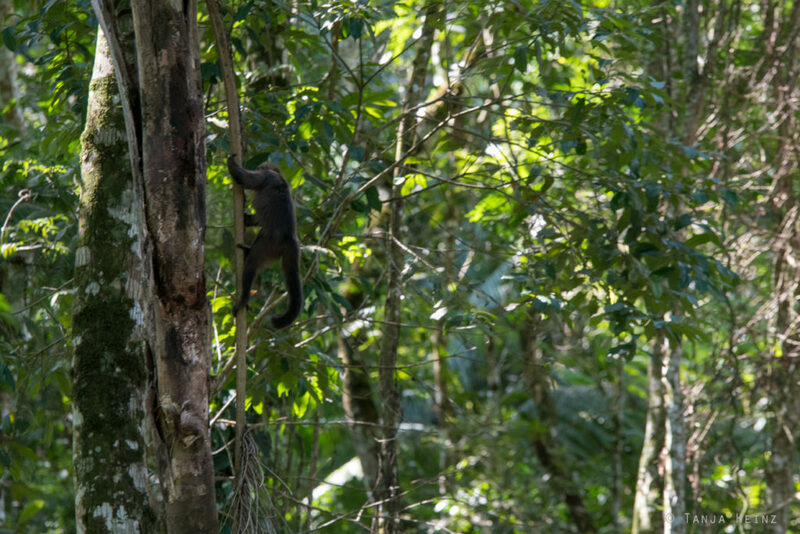 Some of the black capuchins were still climbing eagerly in the trees. I observed only scattered black capuchins on the other side of the road. I spotted again the black capuchin with the pronounced crest. 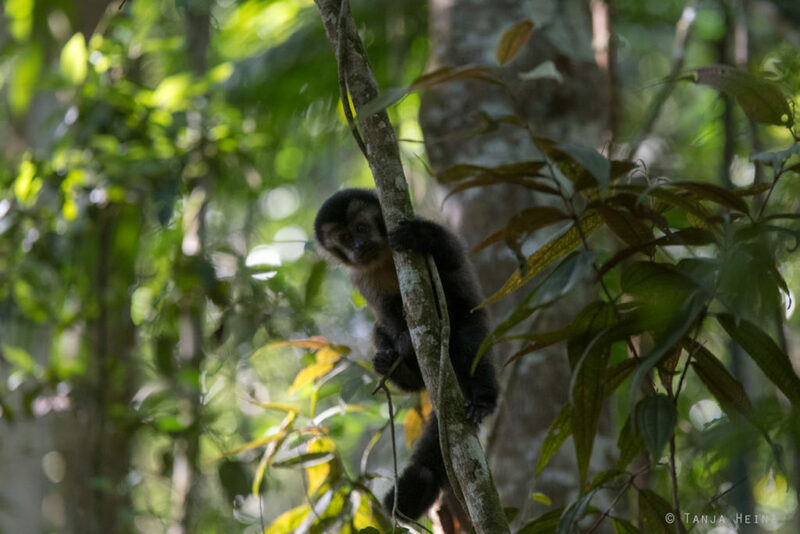 The smaller and middle-sized black capuchins remained a little bit longer around us. However, at the end all of them vanished in the dense Atlantic Forest and left us behind. According to the IUCN they are “near threatened“. 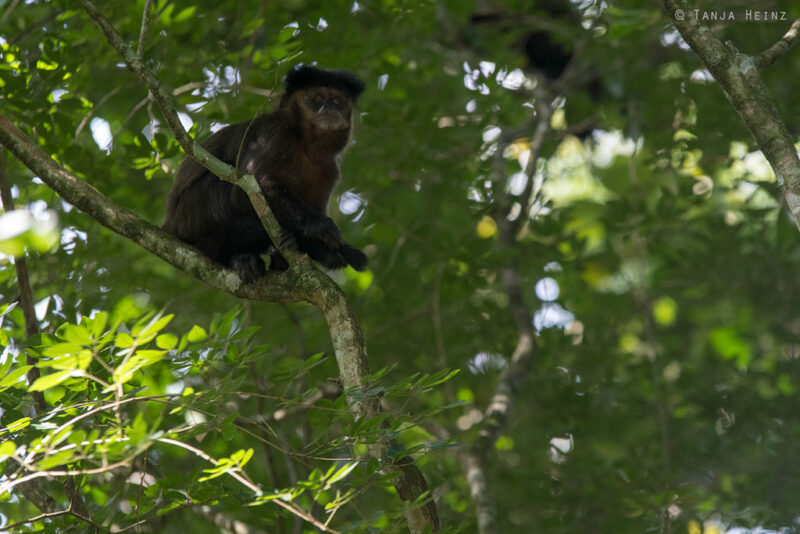 Black capuchins are indegenous not only in Brazil, but also in Argentina. However, they only occur in the North of Argentina. In Brazil, in contrast the distribution extends from Minas Gerais and Espírito Santo across Rio de Janeiro, São Paulo and Paraná down to Santa Catarina and Rio Grande do Sul. On the day of our departure when we were waiting for the bus we met again a group of black capuchins. Maybe it was the same one? Nevertheless, as we had to leave, we could not stay with them. 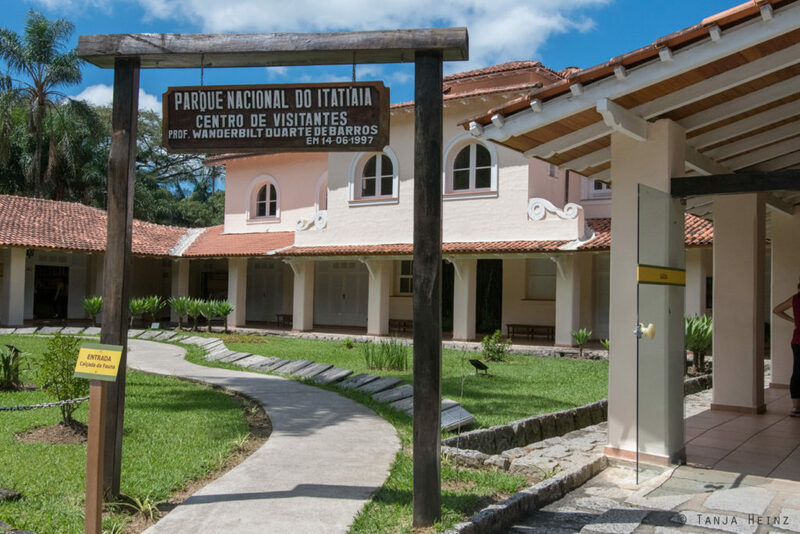 Here I want to show you our accomodation the Itatiaia National Park. 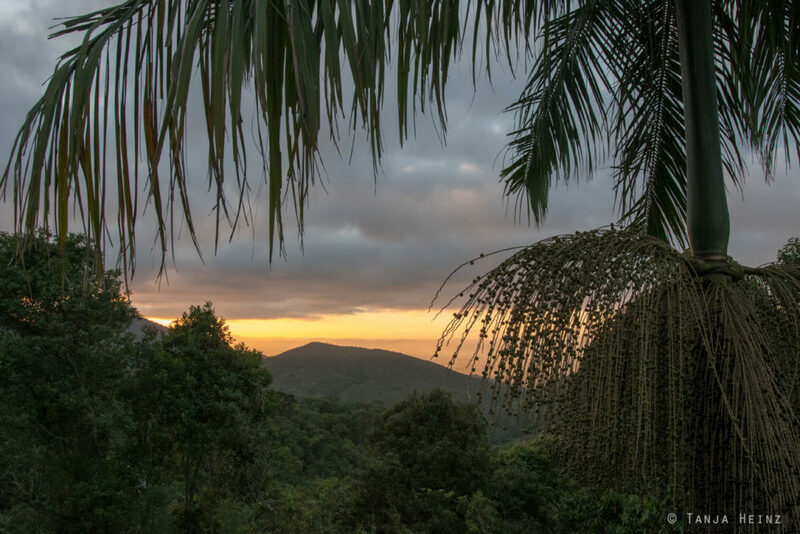 We spent a very nice, pleasant, quiet and enjoyable time at our accomodation in the middle of the Atlantic Forest. 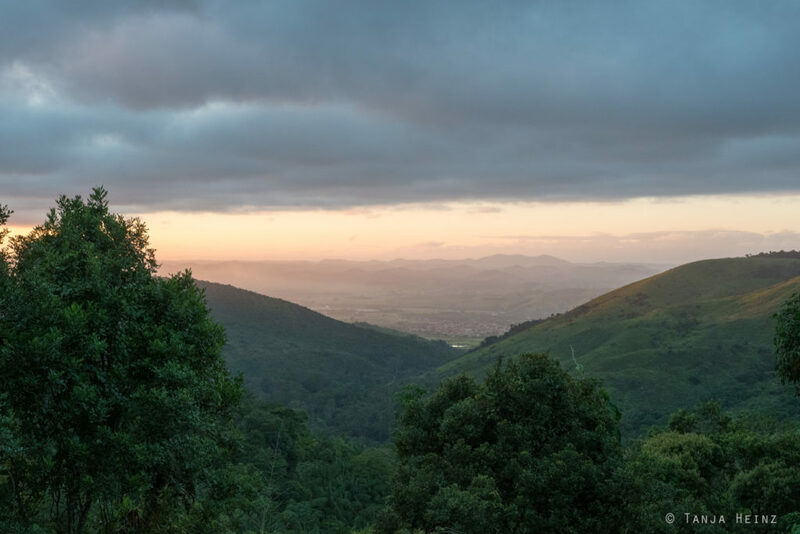 The house of our accommodation was surrounded by beautiful mountains and the views around the house were terrific. We felt very welcome at our accommodation by our very wamrly and sympathetic host. 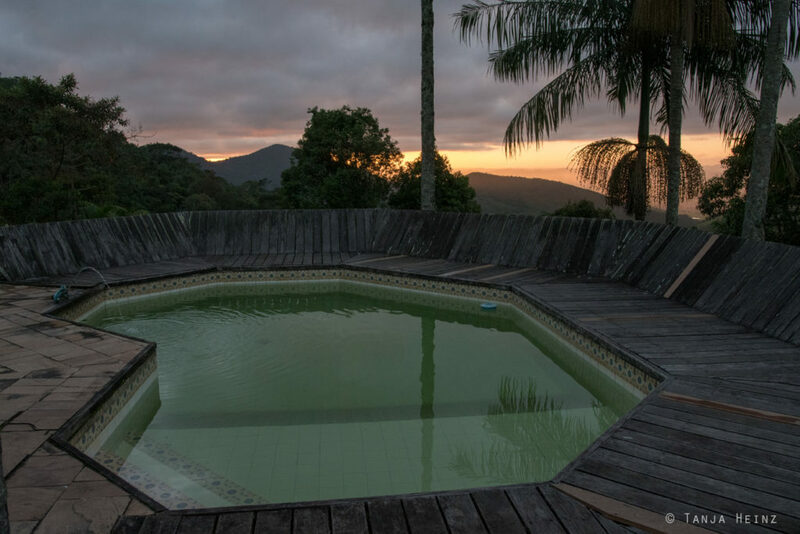 On those two days in the Itatiaia National Park we were the only guests in this big house. I booked this accomodation via Airbnb. 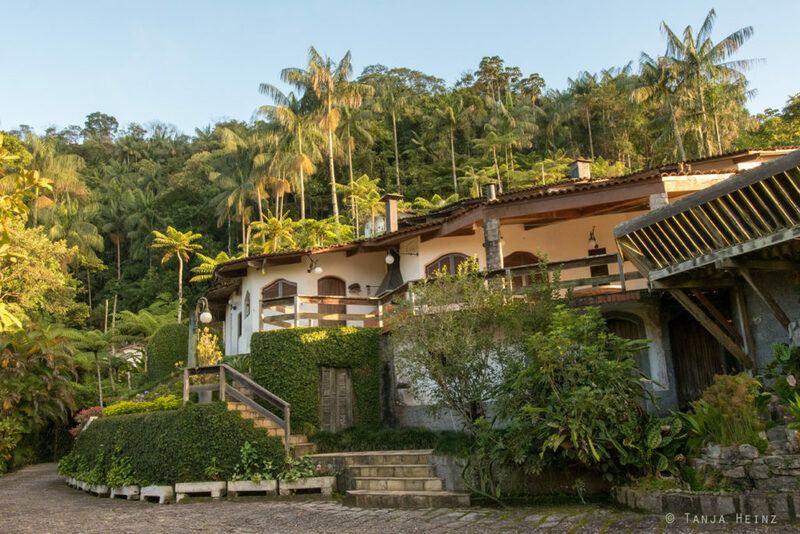 The house is located in the Rua Wanderbilt Duarte de Barros, and thus, close to the entrance area. We paied 107,55 Euros for three nights. 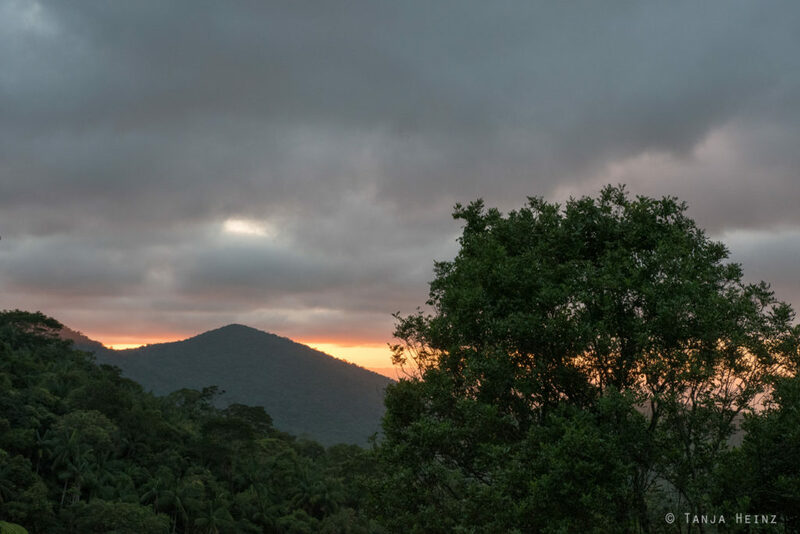 By the way, the house is located within the Itatiaia National Park. Therefore, we had to pay a fee for those two days in the Itatiaia National park at the entrance area. You will find more information about the fees in my first article about the Itatiaia National Park. On our second day I stood up very early to see the sunrise. We could also see Itatiaia from our accomodation. There is also a pool at the house. There was a palm tree. 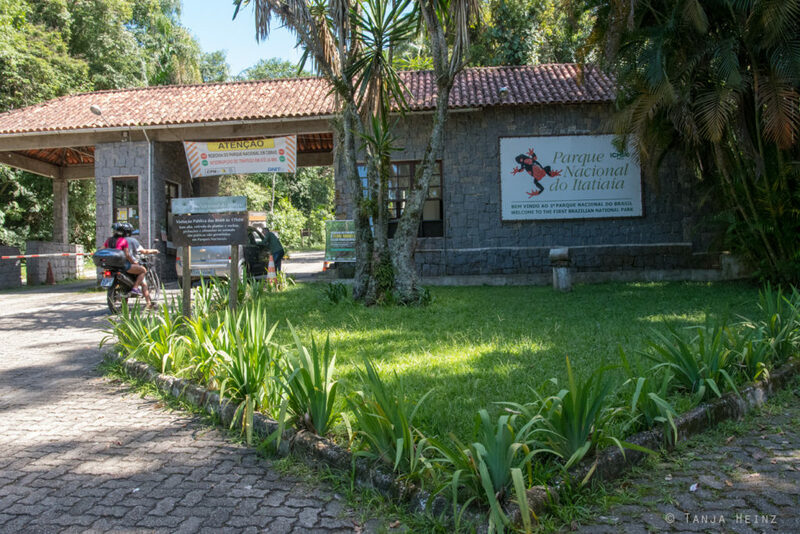 For more information about accomodation, arrival and moving around in the Itatiaia National Park visit my other article about birdlife in the Itatiaia National Park. 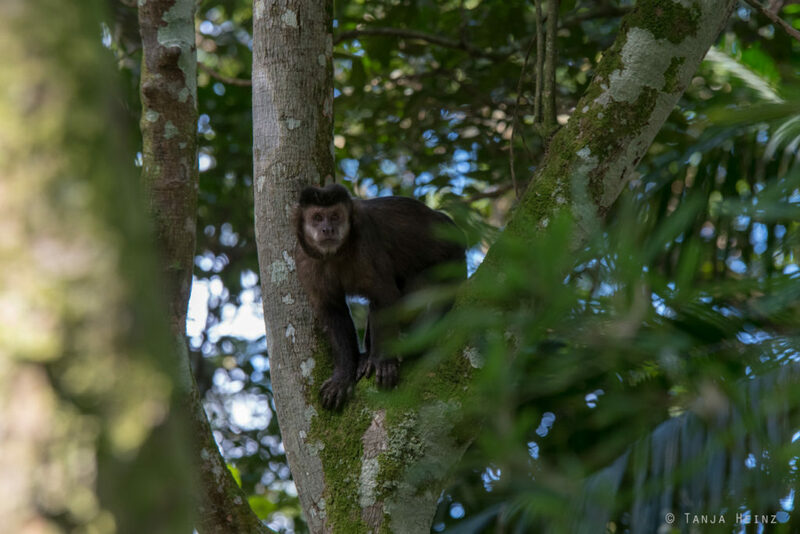 More information about black capuchins and other primates can be found on the website of the project Primatas do Itatiaia.